Roughly a year ago, I celebrated the start of a weekend by doing one of my absolute favorite things: making a Blu Ray purchase. With any other type of shopping, I prepare a strategy in advance that will get me in and out of a store in the shortest amount of time imaginable. Life is too short to spend it grocery or clothes shopping, but adding a movie to my collection? That is simply the bees knees. I could spend hours wandering the aisles of a store containing a vast amount of Blu-ray options and I will enjoy every second of it. On this particular day, I ended up leaving that store with Guillermo del Toro's Pan's Labyrinth in my hand, a blind buy made with faith that I would cherish a film so highly regarded, and I couldn't wait to get home and give it the debut spin. That night, Pan's Labyrinth began and all was well for about 15 minutes until something forced my finger to press down on the stop button and call it a night. Annoying, sure, but no big deal really. I would get back to this magical cinematic world the next day and finally understand what so many people had fallen in love with over the years. The strange thing though is, I didn't get back to it the next day...or the next day, or the next week, or the next month after that and so on. It wasn't that the film did anything wrong during those brief 15 minutes I had witnessed, in fact it had already enchanted me throughout the early moments, but instead it was merely a case of being distracted by other new and shiny options laid out before me. So many brilliant films to see, and seeing as how I now owned Pan's Labyrinth I could get back to it anytime I wanted. No rush. Finally tonight was the night, and after witnessing this exquisite film a part of me is angry that it took so long to delve back into it. The other part of me is trying to focus on a bright side to this story, the side that recognizes how much I have grown with my appreciation for film during that year which possibly allowed me to look at Pan's Labyrinth with a different frame of mind than I would have then. A few months ago I witnessed the masterpiece The Spirit of the Beehive, a film I loved immediately during my initial viewing and my admiration for it continues to grow daily as the imagery and themes of that work linger in my mind and occasionally invade my thoughts. The first 15 minutes of Pan's felt like a completely different experience this time around, as I noticed the striking similarities between Spirit of the Beehive and this film and my appreciation for Del Toro and his ability to embrace the art that inspired him soared to new heights. Pan's Labyrinth tells the story of a young girl named Ofelia as she enters a new world she wants no part of, a move to a different home and a different life due to her pregnant mother's marriage to the cold and ruthless Captain. It is a time of Spanish civil war and Ofelia is surrounded by conflict, both between the men on the battlefield and also her desire to escape this new situation which she recognizes is poisonous, much to her mother's dismay. Ofelia finds comfort in a fantasy world escape from reality after a fairy points her in the direction of a labyrinth that resides nearby, and it is here that she first meets a Faun that recognizes her as royalty and sets her on a quest to leave this all too real nightmare behind forever. Every second of this perfectly crafted beauty fascinated me, but the aspect that most impressed me was the way del Toro so perfectly balanced telling two completely different stories at the same time and yet tonal shifts are never felt, confusion never sets in and while the separation between fantasy and reality is clearly defined, they both manage to enhance the other, as if both a civil war between everyday men and encounters with mythical creatures in impossible locations were needed to form a complete cinematic vision. 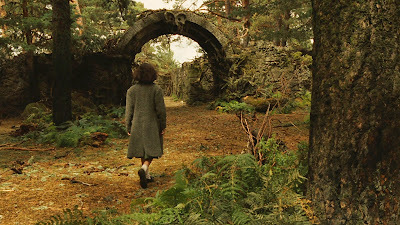 At times hauntingly beautiful and yet at other times just plain haunting, Pan's Labyrinth is an absolute master class in the glory of cinema, completely engrossing and enjoyable as surface level entertainment and yet so thematically rich and profound underneath, an allegory of the highest order. I am both humbled and inspired by this film. I am both concerned about the potential for nightmares derived by its imagery and yet excited about the possibility of visiting an imaginative dream world thanks to del Toro tapping into my subconscious. 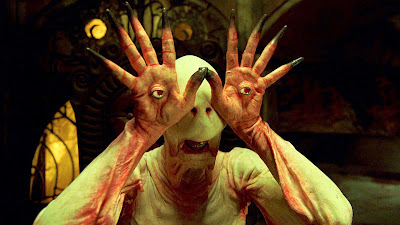 I love so many films, but rarely does one impact me the way Pan's Labyrinth did.